Non-enveloped, flexuous, filamentous, 470-800 nm or more long and 12-13 nm in diameter. Linear ssRNA(+) genome of 5.4-9 kb in size. The 3' terminus is polyadenylated and, in some genera, the 5' end is capped. Encodes 1 to 6 proteins. The virion RNA is infectious and serves as both the genome and viral messenger RNA. RNA-dependent RNA polymerase (RdRp) is translated directly from the genomic RNA. The other ORFS, when present, are transcribed presumably as monocistronic subgenomic mRNAs (sgRNAs). 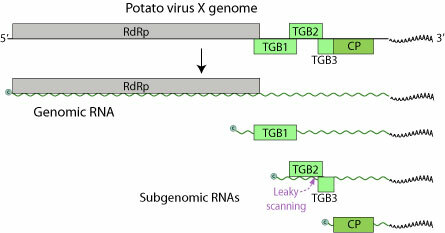 TGB3 is expressed by leaky scanning of the TGB2 subgenomic mRNA.